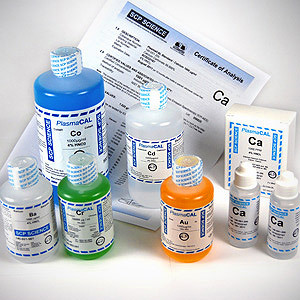 PlasmaCAL Calibration Standards are a full range of single and multi-element calibration standards for plasma spectroscopy. 70 single element standards are available from stock; all with a minimum “unopened” shelf life of up to 21 months and “opened” shelf life of 15 months. With the exception of rare earth standards, PlasmaCAL Standards are available in 1000 and 10,000 ug/ml concentrations in convenient sizes of 2 x 25 ml, 125 ml and 500 ml bottles. Additionally, unique multi-element custom standards are prepared to meet specific laboratories requirements.